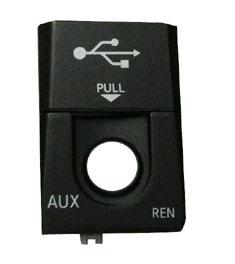 The large selection of Mopar parts at JustforJeeps.com includes this RER Radio USB Door. RER radio systems typically see a lot of use because of the many options available including satellite radio, DVD use and the ability to plug mp3 players into the system. Heavy usage can lead to parts including the USB door to break. If you need a new USB door, consider Mopar item #68020389AA, an OEM part that has been manufactured using the original specifications.